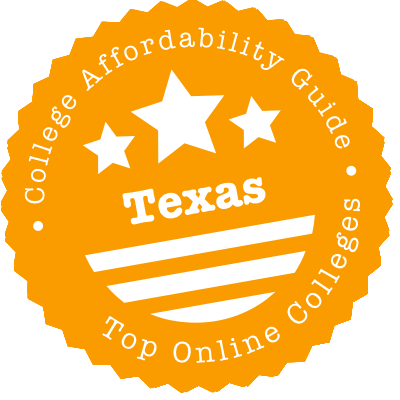 Scroll down to see the top not-for-profit colleges and universities in Texas offering online degree programs. The University of Texas at Arlington offers two bachelor's degrees online and nine Master's degrees: a Registered Nurse to Bachelor of Science in Nursing, a Bachelor of Science in Nursing, a Registered Nurse to Master of Science in Nursing, a Master of Education in Curriculum and Instruction with an Emphasis in Literacy Studies, a Master of Education in Curriculum and Instruction - Mathematics Education, a Master of Education in Curriculum and Instruction - Science Education, a Master of Education in Educational Leadership & Policy Studies, a Master of Science in Nursing in Nursing Administration, a Master of Science in Nursing in Nursing Education, a Master of Public Administration, and a Master of Science in Nursing - Family Nurse Practitioner. Also, the University of Texas at Arlington offers Professional Nursing Pathways Program and Superintendent Certificate. Financial aid is available to online students who qualify, and the University of Texas at Arlington makes it easy for students from other schools to transfer in. Students who already have a bachelor's degree and want to gain teacher certification in Texas can take the required classwork online through Lone Star College's alternative teacher certification program. Students can choose either an internship track or a clinical teaching track to gain experience in teaching. Lone Star also offers transfer degrees and business and professional programs for online students. Students can choose from six transfer degrees that cover the first two years of a four-year degree. Career options include degrees and certificates in areas such as accounting, computer programming, and business administration. Lone Star is one of the top 10 producers of associate-degree-holders in the U.S.
At HCC, any class that is completed at least 85 percent via distance education is considered an online course. Students can filter for both hybrid and online courses on the Eagle Online search tool. Enrollees can complete Associate in Arts or Associate in Science degrees. The core courses in those programs automatically transfer to any public college or university in Texas. The school also runs several online programs not necessarily designed for transfer: Associate in Applied Science degrees in Real Estate and Accounting (also available in certificate format). Central Texas College has an extensive online program, offering more than 60 degrees and certificates that can be completed entirely online. For additional convenience, students can choose from monthly start dates, and classes are delivered in terms from eight weeks to 16 weeks. Students can access all the materials at any time that works for them, helping them fit their studies into their schedule. Many CTC students fit online classes into an overseas deployment. The college is a member of the Servicemembers Opportunity Colleges Degree Network System. Online degrees are available both for students who want to transfer to a four-year school and those seeking technical or career skills. Lamar University offers seven undergraduate degrees and five graduate degrees online: an RN to a BSN in Nursing program; a Bachelor in Business Administration in General Business, Entrepreneurship, or Management; a Bachelor of Science in Criminal Justice; a Bachelor of General Studies; a Bachelor of Applied Arts & Sciences; a Bachelor of Science in Sociology; a Bachelor of Science in Communication; a Master of Education in Educational Administration, Teacher Leadership, School Counseling, Educational Technology Leadership, Special Education, School Counseling, or Digital Learning and Leading; a Master of Education in Clinical Mental Health Counseling; a Master of Nursing in Administration; a Master of Nursing in Education; a Master of Business Administration in Criminal Justice Management, Enterprise Resource Planning, Organizational Management, or Healthcare Administration; and a Master of Science in Criminal Justice. Lamar offers students 5-week, 8-week, 11-week, and 15-week terms, and students can start classes in January, May, June, July, and August. The online programs at Tarrant County College are all in the field of business. Associate of Applied Science degrees are offered in accounting information management, business administration, and office technology. Students who pursue the business administration degree can specialize in accounting assistant, business, or entrepreneurship and small business management. A range of shorter-term certificates are offered in all fields that are covered by associate degrees. In addition to courses offered online by TCC, students can take classes offered through the Virtual College of Texas, which expands the selection of online classes available any term. Texas A & M University - Commerce offers four bachelor's degrees and seventeen graduate programs online. Their online bachelor's degrees are in organizational leadership, business administration, general business, and applied arts and sciences. Their online Master's degrees are in business administration, accounting, finance, curriculum and instruction, early childhood education, reading, educational administration, educational technology leadership, educational technology library science, global eLearning, applied linguistics, biological sciences, health, kinesiology, & sport studies, management, marketing, applied criminology, and technology management. They also offer a doctorate program online in educational administration. They have installment payment plans, tuition loans, and emergency book loans available to assist online students with their financial needs. Students can start classes in the fall, spring, and summer semesters in August, January, and June, and students can also take advantage of mini-mesters beginning in December, May, and August. Texas A & M University makes it easy for students who have attended other colleges to transfer to the school, and students may even be eligible for scholarships specifically for transfer students. Students with an interest in marketing or computer programming skills can enter related online programs at Austin Community College. Associate of Applied Science degrees are available in computer programming with a web programming specialization and in marketing. The college also offers several certificate programs online, including computer programming in C++ or Java, and a certificate for individuals preparing for real estate licensure. Some online classes at Austin Community College require students to come to campus to take tests or to obtain a proctor to monitor a test, depending upon how far the student lives from Austin. Texas Woman's University offers six undergraduate degrees and 11 graduate degrees entirely online including a B.S. in Criminal Justice, a R.D.H. - B.S.D.H. in Dental Hygiene, a B.G.S. in General Studies, a B.A.S. or B.S. in Health Studies, an R.N. - B.S. in Nursing, a B.S. in Sociology, an M.S. in Education of the Deaf, an M.S. in Family Studies, an M.S. in Food Systems Administration, an M.H.A. in Health Care Administration, an M.S. in Health Studies, an M.S. in Kinesiology - All Area Coaching, an M.S. in Kinesiology - Sport Management, an M.L.S. or an M.A. in Library Science, an M.S. in Nursing Education, an M.S. in Nursing Health Systems Management, a Ph.D. in Nursing Science, an M.S. in Nutrition, and an M.S. in Speech/Language Pathology. Online courses are ideal for students who have busy schedules and need to complete coursework at a time that is convenient, but online students should also be motivated and self-disciplined. Students can take classes beginning in January (spring semester), August (fall semester), May (summer semester), June (summer semester), or July (summer semester). Grants, scholarships, student loans, and student employment information may be available to qualifying students. With more than 200 online courses, San Antonio College has all the core courses for an Associate of Arts or Associate of Applied Science available to online students. All the coursework required for the AA with a concentration in mathematics or the AAS with a concentration in criminal justice can be completed through online coursework. For other majors, students might have to take some classes on campus. Courses for several business-related certificates are also delivered online, including marketable skills certificates in banking and financial services. San Antonio College is part of the Alamo Colleges District, which has transfer agreements with several Texas universities. St. Philip's College has three online programs for students who plan to transfer to a four-year school and nearly 20 programs for students seeking career skills. Transfer students can complete an Associate of Arts degree, which covers all the classes for the first two years of college, including general education requirements. St. Philip's also has "field of study" programs in business and criminal justice. Students who plan to major in one of these fields can complete the lower-level classwork online before transferring. For career training, online students can choose programs in early childhood, IT, or business. Both Associate of Applied Science and certificate programs are offered in all three areas. For students looking for online degrees, University of North Texas offers three undergraduate degrees and 20 graduate degrees including a Bachelor of Science in Information Science, a Bachelor of Applied Arts and Sciences in Applied Technology and Performance Improvement, a Bachelor of Science in Rehabilitation Studies, an accelerated Master of Business Administration in Organizational Behavior and Human Resource Management, an accelerated Executive Online Master of Science in Educational Psychology, an accelerated Online Master's Degree in Educational Leadership, a Master of Education in Special Education, a Master of Arts in Applied Anthropology, a Master of Science in Long-term Care, Senior Housing, and Aging Services, a Master of Science in Information Sciences, a Ph.D. in Learning Technologies, and more. Students can take classes in the full-length fall or spring terms that begin in August or January, a summer term that begins in May, and several options for summer terms beginning in May, June, and July. There are several types of financial aid that online students may qualify for like grants, scholarships, and student loans. The University of Texas of the Permian Basin offers seven undergraduate degrees and three graduate degrees entirely online: a Bachelor of Business Administration in Marketing, a Bachelor of Business Administration in Management, a Bachelor of Arts in Communication, a Bachelor of Arts in Psychology, a Bachelor of Arts in Sociology, a Bachelor of Arts in Humanities, a Bachelor of Science in Industrial Technology, a Master of Arts in Bilingual / ESL, a Master of Arts in Educational Leadership, and a Master of Arts in Special Education. Online courses are seven and a half weeks, and they offer six convenient start dates throughout the year in January, March, May, July, August, and October. For online students who are seeking a degree, financial assistance may be available. For students who have completed 24 or more hours at another institution, the University of Texas of the Permian Basin makes it easy for students to transfer in to pursue online degrees. Students who want to transfer to a four-year school can choose from about a dozen Associate of Arts programs that Palo Alto College delivers through online coursework, with options ranging from business to kinesiology. Future teachers can earn an Associate of Arts in Teaching, another fully transferable degree. Students who want more immediate job skills can choose from six Associate of Applied Science degrees, mostly in business and IT. Palo Alto also has nearly 20 online certificates in business and IT topics. Palo Alto takes part in the Virtual College of Texas, which allows students to take online classes from other schools and get credit through Palo Alto. Sam Houston State University offers seven undergraduate degrees, 27 graduate degrees, and two doctorate degrees entirely online including a Bachelor of Arts in Criminal Justice, a Bachelor of Business Administration in General Business Administration, a Bachelor of Arts in History, a Bachelor of Science in Nursing, a Bachelor of Science in Psychology, a Master of Education in Administration, a Master of Agriculture, a Master of Arts in Band Conducting, a Master of Business Administration, a Master of Arts in Communication Studies, a Master of Science in Digital Forensics, a Master of Arts in History, a Master of Arts in Sociology, a Master of Arts in Teaching, a Doctor of Education in Developmental Education Administration, and more. Sam Houston State University is a military friendly school, and online degrees are a great option for active military and veterans. For students who are transferring to SHSU, there is a lot of helpful information on the website that will help potential transfer students determine if their credits will transfer and whether or not they meet the admission requirements. Online students may qualify for financial aid in the form of grants, scholarships, and also student loans. Collin County Community College has a reputation for excellent teaching, as the faculty includes four U.S. Professors of the Year and four people named Texas Professor of the Year. About one-quarter of students attend online classes, which are offered either in an asynchronous, fully online format or in a blended format that combines some time in a traditional classroom with online classes. Collin offers both transfer associate degrees for individuals who plan to transfer to a four-year school and career education. Students can take advantage of Collin College's partnerships with 10 universities that make it easy to transfer once they earn their associate degree. Texas Tech University offers eight undergraduate degrees, 20 Master's degrees, and seven doctoral degrees including a Bachelor of General Studies, a Bachelor of Science in Human Sciences, a Bachelor of Science in Biology, a Bachelor of Arts/Science in University Studies, a Master of Arts in English, a Master of Arts in Technical Communication, a Master of Education in Curriculum and Instruction, a Master of Education in Higher Education, a Master of Education in Special Education, a Master of Science in Agricultural Education, a Master of Science in Software Engineering, a Doctor of Education in Agricultural Education, a Doctor of Philosophy in Curriculum and Instruction, a Doctor of Education in Higher Education, and more. They also offer many graduate certificates. Financial aid is available for students who are eligible in the form of grants, scholarships, and loans. Classes start in January, June, July, August, and December. Students can complete coursework whenever it is convenient to them, which makes online courses ideal for those with busy schedules. West Texas A & M University offers six undergraduate degrees and five graduate degrees: a B.A. and B.S. in Criminal Justice - Administration Emphasis, a Bachelor of General Studies, a Bachelor of Business Administration, a Bachelor of Applied Arts and Sciences, a Bachelor of Emergency Management Administration, an R.N. to B.S.N. Degree Completion Program, a Master of Business Administration (with an emphasis in Computer Information Systems, Health Care emphasis, Management, and Marketing), a Master of Education in Instructional Design and Technology, a Master of Education in Curriculum and Instruction (with a C&I option and a Special Education option), and an R.N. to M.S.N. Comprehensive. The financial aid office at West Texas A & M University offers students information and assistance with all of their financial needs. Students who wish to transfer to WTAMU can refer to the transfer course equivalencies page to see how their previous courses will transfer. Online students are able to complete coursework on their own schedules, and classes begin in January, June, July, and August. University of Houston-Downtown offers seven Bachelor of Business Administration (BBA) degrees online in enterprise information systems, finance, general business, international business, management, marketing, and supply chain management. The online classes are all taught by the same professors who teach courses on campus, with similar lesson plans and books. They have many different start dates and term lengths including full-length 16-week semesters beginning in January and August; 8-week courses beginning in January, March, August, and October; a 4-week long May term; a 5-week term beginning in June; an 8-week term beginning in June; and a 5-week term beginning in July. Online courses are ideal for working students or students with families as they allow students to do coursework at a time that is convenient. University of Houston-Downtown has a relatively straightforward process for students transferring in or out of the school, and financial aid is available based on financial need and academic achievement. The University of Texas at Tyler has 16 online degree programs, ranging from bachelor's completion to a doctorate. Individuals with some college credits can complete a Bachelor of Applied Arts and Sciences. Degree-completion students might get additional credits for prior learning acquired on the job, in the military, or by other means, to speed their degree. An RN to BSN is also offered. The College of Education and Psychology and College of Nursing and Health Services have the most online options. Five master's degrees are available in education fields. The College of Nursing has three nursing master's programs, a nursing Ph.D., and a master's in kinesiology. Other online master's programs include MBA and English. The University of Texas Rio Grande Valley - created by combining the resources of UT Pan American, UT Brownsville, and the Regional Academic Health Center - offers online degrees in traditional and accelerated modes. Accelerated options include an MBA with three specializations that students can complete in as little as 12 months. Courses run for seven weeks, and new students can choose from multiple start dates each year. Programs leading to master's degrees in education, nursing and health sciences, and public affairs are delivered in a similar accelerated format. Students who don't want the compressed schedule of an accelerated program can earn degrees in education, math, and health sciences in a traditional program. Related graduate certificates are also delivered online. Navarro College has about a dozen degrees and certificates that can be earned entirely online. Most are transfer associate degrees for students completing their first two years of college before transferring to a more expensive four-year school. Transfer programs include English, general studies, speech, and psychology. In a few cases, students can earn a transfer degree or a more career-focused Associate in Applied Science in the same or similar topics. For instance, criminal justice students can earn either an Associate in Arts or Associate in Applied Science. Navarro is part of the Virtual College of Texas, which enables students who can't get a specific course they need at Navarro to take the class through another VCT school. South Texas College advertises it has more than 30 online programs where you "never step foot on campus." The college has about 20 online associate degrees in a broad range of majors. Students who complete these degrees can transfer to a four-year school as a junior. South Texas College has transfer partnerships with more than 150 schools, giving students a wealth of choices. Four bachelor's degrees are available online, including a competency-based degree in organizational leadership that provides credit for prior learning and allows students to move through courses quickly by showing they've mastered the subject. The other bachelor's degrees follow a traditional format. South Texas also has about 10 online certificates in fields of accounting and business. The School of Education, Health Professions and Human Development Department dominates distance learning at UHV, running a dozen online MEds, six teaching and education certifications, and an RN to BSN program for nurses. Not to be left behind, the School of Business Administration place its Global MBA and Strategic MBA programs online, as well as its Master of Science in Economic Development and Entrepreneurship. Undergrads have to head to campus for at least some coursework, but the upper-division business core courses are all online, as is most of the coursework within the concentrations. The School of Arts and Sciences runs degrees as well - from an MFA in Creative Writing to a BA in Psychology. Texas A & M University - College Station offers three undergraduate degrees in EC-6 generalist, middle grades 4-8 language arts/social studies, and middle grades 4-8 math/science. Also, Texas A & M University - College Station offers 14 graduate degrees in culture and curriculum, English as a second language, master reading teacher certification, mathematics education, online Ed.D in curriculum and instruction, STEM online, online M.Ed. (generalist), online M.Ed. (elementary education cohort), online M.Ed. (rural teacher leadership cohort), graduate certification program, reading and language arts, reading specialist certification, science education, and urban education. Students may apply for financial aid in the form of grants, loans, and scholarships. Scholarships are given on the basis of academic achievement, financial need, special circumstances, etc. Students who wish to transfer to Texas A & M University - College Station should consult the Transfer Course Sheets for coursework information for their intended major. For students seeking online degrees, the University of Texas at El Paso offers several options. They offer six bachelor's degrees and 11 Master's degrees: a Bachelor of Arts in Criminal Justice, a Bachelor of Arts in Organizational and Corporate Communication, a Bachelor of Arts in Security Studies, a Bachelor of Multidisciplinary Studies, a Bachelor of Science in Health Promotion, a Bachelor of Arts in Media Advertising, a Master of Defense and Strategic Studies, a Master of Fine Arts in Creative Writing, a Master of Education in Curriculum and Instruction with a Concentration in Bilingual Education, a Master of Education in Curriculum and Instruction with a Concentration in Early Childhood Education, a Master of Science in Systems Engineering, a Master of Science in Construction Management, a Master of Science in Nursing - Nursing Education, a Master of Science in Nursing - Nursing Systems Management, and a Master of Science in Nursing - Nurse Practioner. The University of Texas at El Paso also offers a graduate certificate in technical and professional writing. These courses are taught by the same faculty who teach the on-campus classes. UTEP offers many excellent and informative resources on their website to prepare students for online learning. The Texas Tech University Health Sciences Center offers distance learning programs through two of its schools. The School of Nursing has online programs at all levels, including a Doctor of Nursing Practice. At the bachelor's level, three programs are available: RN to BSN, an accelerated second degree BSN program, and an accelerated veteran BSN program. Nurses can also earn an MSN, post-master's certificate, or inter-professional graduate certificate online. The School of Health Professionals has eight degrees online, including two doctorates in physical therapy. Master's programs counseling (addiction, clinical rehabilitation, and clinical mental health) and health care administration. Individuals interested in clinical laboratory science can earn a certificate or second bachelor's degree in the field. University of the Incarnate Word placed in the top 50 on U.S. News and World Report's 2017 list of the best online bachelor's programs. Those programs - as well as its certificates and associate, master's and doctoral degrees - are offered via the School of Professional Studies (SPS) and the School of Applied Sciences (SAS). Both schools require applicants to have been out of school for at least five years and have accumulated three years of work experience. No surprise then that many students are active military members or veterans. The university's degrees tilt toward health and business, but UIW strives to create a liberal arts experience, meaning that associate and bachelor's degree seekers should find their niche available online. Tyler Junior College, one of the largest community colleges in Texas, has 10 Associate of Arts degrees that can be completed entirely online, allowing students to choose majors such as social work, economics, or business. The benefit of an AA is that students can complete the required core curriculum, or general studies classes, needed for any public college in Texas and take lower-level classes in their planned major. TJC also allows online students to complete just the core curriculum if they choose. Several certificates can be completed 100 percent online, including criminal justice. TJC has some technical associate degrees with an online component but they all require on-campus attendance, ranging from one on-campus class to 12. WBU Online aims to provide a Christian education via distance learning no matter the academic level. It's the rare university to offer associate degrees - with five AAS degrees designed to transfer (and since Wayland holds regional accreditation, their degrees likely will transfer). The school has a further 10 Bachelor of Applied Science programs to go along with BBA's, BS's, BA's and a Bachelor of Christian Ministry. Master's degrees are even more varied and prolific, and the school even offers an online Doctor of Management. And did we mention the post-graduate certifications for aspiring Texas principals and superintendents? Amarillo College offers online programs for students who plan to transfer to a four-year school and for students who want to gain skills for the job market. The college offers four Associate in Science programs online, which are designed for students who want to complete the first two years of college before transferring. The A.S. programs available online include business administration, criminal justice, and psychology, and they are all four-semester, 60-credit programs. The Associate in Applied Science in Radiological Therapy is a 65-credit program that prepares students for professional certification and a job as a radiologic technologist. The college also has an online Mortuary Science Certificate that prepares students for licensure as a funeral director in Texas. The online offerings at Trinity Valley Community College can help transfer students or people seeking career skills. Students who want to earn a four-year degree can complete all the classwork needed for the first two years online through TVCC. These students typically earn an Associate of Arts degree, which is a liberal arts degree, but TVCC also has online tracks for computer or business majors. The other online programs TVCC offers are technical degrees in fields including computer science, information systems support, and legal assistant technology. Online Associate of Applied Science degrees are also offered in office technology, accounting, and management. TVCC is part of the Virtual College of Texas, which expands the online classes TVCC students can take. LeTourneau University offers two associate degrees, thirteen bachelor's degrees and seven Master's degrees including an Associate in Criminal Justice; an Associate in Interdisciplinary Studies; a Bachelor of Science in Aviation Studies; a Bachelor of Science in Aviation Management; a Bachelor of Arts or Science in Biblical Studies; a Bachelor of Science in Criminal Justice; a Bachelor of Human Services; a Bachelor of Science in Business Administration (Finance, Human Resource Management, or Nonprofit Management); a Bachelor of Business Administration; a Bachelor of Business Management; a Bachelor of Science in Computer Information Systems; a Bachelor of Science in Healthcare Management; a Bachelor of Science in Health Information Systems; a Bachelor of Science in Interdisciplinary Studies; a Bachelor of Science in Psychology; a Master of Engineering Management (Aerospace Management, Oil & Gas Management, Program Management, and Software Engineering); a Master of Strategic Leadership; a Master of Science in Health Care Administration; a Master of Business Administration; Professional Master of Business Administration; a Master of Education (Curriculum and Instruction, Education Administration, Teaching and Learning, and Teacher Leadership); and a Master of Arts in Psychology. Classes begin in August and January in full-length fall and spring terms. Financial aid in the form of grants, scholarships, loan, and work study programs. For students who seek online degrees, Tarleton State University offers several options. Their 10 undergraduate degrees and 10 graduate degrees include a Bachelor of Business Administration in Administrative Systems, a Bachelor of Science in Applied Science, a Bachelor of Applied Arts and Science in Business, a Bachelor of Applied Arts and Science in Criminal Justice Administration, a Bachelor of Business Administration in General Business, a Bachelor of Applied Technology in Health Professions Technology, a Bachelor of Applied Arts and Science in Information Technology, a Bachelor of Applied Arts and Science in Manufacturing and Industrial Management, a Bachelor of Science in Psychology, a Bachelor of Veterinary Technology, a Master of Science in Agricultural and Consumer Resources, a Master of Business Administration, a Master of Criminal Justice, a Master of Education in Educational Administration, a Master of Arts in English, a Master of Science in Human Resources Management, a Master of Science in Information Systems, a Master of Music in Music Education, and a Master of Science in Quality and Engineering Management. Online students may qualify for financial aid, and classes begin in January, March, May, June, July, August, and October. Stephen F. Austin State University offers six undergraduate degrees, 13 graduate degrees, and several certificate programs including a Bachelor of Science in Nursing, a Bachelor of Science in Interdisciplinary Studies (in Special Education Teacher Certification, Early Childhood-6 Teacher Certification, or Middle Level Grades 4-9 Teacher Certification), a Bachelor of Business Administration in General Business, a Bachelor of Science in Human Sciences (Emphasis in Child Development & Family Living), a Master of Public Administration, a Master of Arts in Mass Communication, a Master of Science in Human Sciences, a Master of Science in Resources Interpretation, a Master of Education (in Standard Elementary Program, EC-6 and 4-8 Alternative Teaching Certification, Educational Leadership with Principal Certification, Content Emphasis Program, or Special Education), a Master of Music in Music Education, a Master of Arts in Teaching with EC-1a2 and 7-12 Teaching Certification, and more. There are full-length fall and spring terms, two summer terms, and a shorter Maymester for students to take advantage of. Online students may be eligible for financial aid in the form of scholarships, loans, grants, and more. For students seeking degrees online, the University of Houston offers four undergraduate degrees and ten graduate degrees: a Bachelor of Science in Organizational Leadership and Supervision, a Bachelor of Science in Psychology, a Bachelor of Science in Retailing and Consumer Science, a Bachelor of Arts in Psychology, a Master of Science in Construction Management, a Master of Education in Curriculum and Instruction - Early Childhood Education, a Master of Education in Curriculum and Instruction - Health Science Education, a Master of Education in Curriculum and Instruction - Mathematics Education, a Master of Science in Foresight, a Master of Education in Higher Education, a Master of Arts in Mathematics, a Master of Social Work, a Master of Education in Special Education, and a Master of Science in Subsea Engineering. There are start dates in every month of the year, which makes it convenient for online students. Financial aid is available for online students as it is for on-campus students, and the University of Houston makes it simple for students to transfer in from other schools. Angelo State University offers a wide range of online courses, and several degrees can be competed entirely online. Undergraduates can earn a bachelor's degree in border and homeland security or in intelligence and security studies. Graduates of the Community College of the Air Force can transfer credits to those same undergraduate programs and complete their degree online through ASU. Teachers, nurses, and security personnel can earn specialized master's degrees online through Angelo University. The university also has about a dozen certificates and certifications for teachers and nurses, including teacher, school counselor, and principal certification. Our Lady of the Lake University has five master's programs and one bachelor's that can be earned online. The Bachelor of Arts in Criminology and Criminal Justice requires students to perform a practicum with a community agency. MBA students can select a management or health care management track. The Master of Science in Information Systems and Security is NSA-certified and students can complete it in a year while continuing their job. Applicants without the necessary technical background can take a six-credit online Cyber Security Boot Camp before starting the MS. Other online master's programs include social work, nonprofit management, and school counseling. OLLU was No. 86 in Regional Colleges West on the 2018 U.S. News Best College list. Midwestern State University has four undergraduate degrees and nine graduate degrees that can be completed entirely online. They are as follows: a Registered Nurse to Bachelor of Science in Nursing, a Registered Respiratory Therapist to Bachelors of Science in Respiratory Care, a Bachelor of Applied Arts and Sciences, a Bachelor of Radiologic Sciences, a Master of Arts in Training & Development, a Masters of Business Administration, a Masters of Criminal Justice, a Master of Education in Educational Leadership, a Master of Education in Sport Administration, a Master of Education in Special Education, a Masters in Health Administration, a Master of Science in Nursing, and a Master of Science in Radiologic Sciences. For online students, they offer full-length fall and spring terms beginning in August and January in addition to two summer terms that begin in June and July and two mini-semesters beginning in May and December. This gives students many options for taking the courses they need. For students who are wondering whether or not online degrees are for them, they have a Distance Education Self-Evaluation on their website. Online students may qualify for financial aid in the form of grants, scholarships, and student loans. Dallas Baptist University offers three associate degrees (an Associate of Arts, an Associate of Biblical Studies, an Associate of Business Administration), four bachelor's degrees (a Bachelor of Arts in Biblical Studies, a Bachelor of Arts and Sciences in Christian Ministries, Communication, Criminal Justice, Health Care Management, Interdisciplinary Studies, Psychology, or Sociology, a Bachelor of Business Administration, and a Bachelor of Business Studies), and fifteen Master's degrees (a Master of Arts in Children's Ministry, a Master of Arts in Christian Education, a Master of Arts in Christian Ministry, a Master of Arts in Family Ministry, a Master of Arts in Leadership, a Master of Arts in Management, a Master of Arts in Professional Development, a Master of Arts in Student Ministry, a Master of Arts in Teaching, a Master of Arts in Theological Studies, a Master of Arts in Worship Leadership, a Master of Business Administration, a Master of Education in Curriculum and Instruction, a Master of Education in Educational Leadership, a Master of Education in Higher Education, and a Master of Liberal Arts) entirely online. Financial aid may be available to students pursuing online degrees. There are many different sessions available for students including a winter session specifically for online courses, a spring session, a fall session, a summer session, and several mini sessions throughout the year. Western Texas College doesn't host any fully online programs per se, but through WTC Online it runs about 100 distance learning courses each semester, plus a handful during its shorter fall flex and midwinter terms. That's actually enough to get a transfer degree, which is what most WTC students are trying to do. Therefore, most mandatory courses from the school's core general education curriculum, including science, math and English, are available via distance learning. However, the school also places a fair number of vocational courses online for students in associate-level career programs such as Early Childhood Education, Information Technology and Petroleum Technology. The College of Nursing and Health Science at Texas A & M University offers an online RN to BSN degree for students with a diploma or associate degree in nursing and a valid Texas RN license. On the graduate level, the following Master of Science in Nursing (MSN) degrees are available online: MSN Family Nurse Practitioner, MSN Leadership in Nursing Systems, and MSN Nurse Educator. There is also a Doctor of Nursing Practice (DNP) degree available online, as well as a Doctor of Philosophy in Nursing Cooperative degree offered in conjunction with Texas Women's University. The College of Science and Engineering offers an online Master of Science (MS) degree in geospatial surveying engineering with a thesis or non-thesis option. The following MS degrees are also available online from the College of Education and Human Development: MS in Instructional Design and Educational Technology, MS in Kinesiology, and MS in Reading. An AACSB-accredited Master of Business Administration (MBA) degree is also available online. Students with an undergraduate degree in business administration from an accredited college or university can expect to complete the program in 12 months. Those without this background may be required to complete up to four additional courses for the degree. Grayson College has four degree programs that are available completely online. One is an associate degree in general studies, which is designed for students who want to complete their general education requirements before transferring to a four-year school to complete their bachelor's degree. The other three programs are in criminal justice, child development, and education. In addition to classes for all those programs, Grayson delivers hundreds of courses online for the convenience of busy students. Grayson offers a winter minimester at the end of the fall semester, allowing students to complete one course in just a few weeks, speeding their path to graduation. Many of these courses are delivered online. UHCL Online earned an Effective Practice Award in 2016 from the Online Learning Consortium, a professional association that publishes the journal Online Learning. Undergrads can choose from one of four Bachelor of Science degrees: Anthropology, Finance, General Business, and Public Service Leadership. Graduate degrees are more numerous. The nine programs overwhelmingly cluster around business, and the school finds a way to integrate management principles across disciplines - there's an MS in Educational Management, MS in Engineering Management, and MA in Human Resource Management. Educators and engineers should look into the school's graduate certificate programs. Southwestern Assemblies of God University has 100 percent online options for the majority of degrees that are available through on-campus study, giving students options whether they are seeking a master's degree, bachelor's degree, or associate degree. Online students can even enroll in a fast-track program to earn both a bachelor's and master's degree in four church leadership and ministry tracks. Online master's programs are available in fields including Bible and theology, business administration, children and family ministry, psychology, divinity, education, history, intercultural studies, organizational leadership, and practical theology. Master's candidates may have to take part in practicum experiences, and some of the online master's programs allow them to choose a thesis or non-thesis option. SAGU has online bachelor's degrees in history, Bible and church ministries, business, counseling, psychology, education, English, and interdisciplinary studies. Associate degree programs include addiction counseling, business administration, education, English, psychology, and social studies. Coursework is delivered in an asynchronous format, allowing students to log on at their convenience to participate in their class. SAGU allows undergraduates to receive up to 45 hours of academic credit for experiential learning. Concordia University currently offers four online nursing programs: RN to Bachelor of Science in Nursing (BSN), RN to Master of Science in Nursing (MSN), RN+ to MSN, and a stand-alone MSN. The RN+ to MSN degree is designed for RNs who hold a bachelor's degree in a non-nursing field, which may make it possible to earn the MSN degree sooner. The MSN program offers concentrations in leadership, education, and informatics. The following Bachelor of Arts (BA) degrees are available online: BA in Communications, BA in Computer Science, BA in Criminal Justice & Criminology, and BA with Multidisciplinary major. Students accepted to the BA in Criminal Justice & Criminology program can choose to pursue a general track or one of the following areas of emphasis: management, homeland security, and crime scene investigation. There are two additional undergraduate degrees available online - Bachelor of Applied Arts and Sciences in Business and Bachelor of Business Administration. On the graduate level, Concordia University offers the following Master of Education (M.Ed.) degrees online: M.Ed. in Sports Administration, M.Ed. in Advanced Literacy Instruction, M.Ed. in Differentiated Instruction, M.Ed. in Education Administration, and M.Ed. in in Special Education. A Master of Business Administration (MBA) degree is also available online. Weatherford College participates in the Virtual College of Texas, meaning that even if it's not offering a course, it can place its students into one offered by another community college in the state. With proper planning, that may not be necessary - the college tries to place all of the general education courses needed for a transfer degree online. Expect, then, to see multiple slots for introductory history, biology and English courses every term. The college also partners with third parties to give students access to online Workforce and Continuing Education modules. The Center for Legal Studies, for instance, enrolls Weatherford students into standalone law school prep and paralegal studies courses. Texas A & M University - Kingsville offers five graduate degrees for students to complete entirely online. They include a Master of Education Degree in Adult Education, a Master of Business Administration Degree, a Master of Education in Educational Administration, a Master of Science in Industrial Engineering, and a Master of Education in Instructional Technology. There are many types of financial aid online students may take advantage of such as grants (the Pell Grant, the Texas Grant, the Texas Public Educational Grant, the Graduate Tuition Grant), student employment (college work-study program), federal direct loans, and scholarships. Students may take courses in a full-length fall semester that begins in August; a full-length spring session beginning in January; 8-week sessions beginning in January, March, August, and October; three summer sessions beginning in May, June, and July; and 4-week intersessions in May, August, and December. The University of St. Thomas in Houston has a completely online Master of Education that allows students to choose a specialty in counselor education, educational leadership, special education, dual language instruction, curriculum and instruction, or generalist. Students in the program also have the option of following a hybrid schedule with both online and in-person classes. Online courses are delivered in an asynchronous format. Candidates must complete 36 credits and perform at least field experiences. The college offers scholarships for students enrolled in the leadership, special education, and bilingual/dual language specialties. The University of St. Thomas also has an adult degree completion program that gives students the option of taking some of their classes in an online format, although there is no guarantee all required classes will be available online. The adult degree completion program is designed for students who are at least 25 years old, have at least 60 credits to transfer, and earned a 2.5 or better GPA in previous college work. The Master of Science in Data Science degree offered at Southern Methodist University (SMU) is an interdisciplinary program that can be completed almost entirely online. Students learn and work with faculty from three SMU schools - Meadows School of Art, Lyle School of Engineering, and Dedman College of Humanities and Sciences. Classes are held in a virtual classroom and all coursework and materials are available 24/7. There is also a two-year, dual degree Master of Science in Engineering (MSE) and Master of Business Administration (MBA) program offered by the Bobby B. Lyle School of Engineering and the Edwin L. Cox School of Business. The required MBA courses for this program are only available on campus, but students have the option of enrolling online for the engineering courses. Students can choose to take a master's in any engineering field available at the university (civil, computer, electrical, environmental, mechanical, software, and telecommunications and network engineering). SMU also offers a wide range of online courses in the fields of general education, markets and culture, and continuing and professional education. Online students are encouraged to apply for the same scholarships and grants that are available to on-campus SMU students. The University of Dallas offers several online programs for students interested in a master's degree in theology, business, or cybersecurity. Students can earn the 30-credit MBA entirely through online coursework. By completing an additional 14 credits of coursework, MBA candidates can achieve a concentration along with their MBA. Concentrations are available in accounting, business analytics, finance, cybersecurity, information and technology management, or global business. The Master of Science in Cybersecurity is another 100 percent online program, and students can take four additional courses to earn an MBA with a concentration in cybersecurity. A third online business option is the Master of Science in Information and Technology Management. Applicants for any of the business master's degrees must have a bachelor's degree. In addition to looking at previous academic performance, the admissions process also examines work experience and optional GMAT/GRE scores. The Neuhoff School of Ministry offers an online option for the Master of Theological Studies with concentrations in biblical studies or Catholic secondary school teaching. The University of Dallas also offers a three-year-long, 12-module Catholic Biblical School to online learners around the world. Addressing the needs of non-traditional adult learners, the School of Business at Lubbock Christian University offers two Bachelor of Science (BS) degrees that can be pursued online: BS in Organizational Management and BS in Organizational Leadership. A third baccalaureate program, the Bachelor of Arts in Business Administration, is also available online. However, only the management emphasis of this program can be completed online. On the graduate level, there are two Master of Science (MS) programs that are offered entirely online - MS in Human Services and MS in School Counseling. Both of the specialization areas for the MS in Human Services degree (administration and family life educator) are also available online. Students accepted to the MS in Clinical Mental Health Counseling or the MS in Counseling program can take a majority of their courses (up to 75 percent) online. The Graduate School of Education offers online courses for two of its programs - Master of Education in Educational Leadership and Principal Certification. The following graduate programs follow a hybrid delivery system (50 percent online courses and 50 percent on-campus classes): Master of Arts in Biblical Interpretation, Master of Christian Ministry, MS in Family Ministry, Master of Divinity, and Superintendent Certification. Baylor University offers online programs leading to an MBA and a Master of Science in Nursing in Leadership and Innovation. The MBA program is offered in an accelerated format that students can complete in 12 to 16 months, depending upon their undergraduate background. Students who earned a bachelor's degree in business from an AACSB-accredited college can complete the program in one year by taking two courses per term. Students who did not major in business and business majors whose school did not have AACSB accreditation must take five foundational courses before they begin the MBA program, so it will take them about 16 months to complete the master's program. Foundational courses are offered on a pass-fail basis and do not count toward the student's GPA. The nursing program is open to working nurses who have an unencumbered nursing license and at least two years of full-time experience. Nursing applicants will have come to Baylor's campus in Waco, Texas, at least three times - for an admissions interview, for orientation before beginning coursework, and for a comprehensive oral exam after completing all coursework. The Naveen Jindal School of Management at the University of Texas Dallas offers two Master of Business Administration (MBA) programs online - Professional MBA (PMBA) and Global Leadership Executive MBA (GLEMBA). All required coursework for the PMBA program is available online; however, not all elective courses are, so students are limited as to the concentration area they can pursue online. The GLEMBA program requires students to attend on-site, week-long retreats at the beginning of each semester and an international study tour in the last semester of the program. U.S News & World Report (2016) ranks Jindal's online MBA program as Top 9 online MBA program in the country. In addition to the MBA, the school offers the following Master of Science (MS) degrees online: MS in Accounting, MS in Information Technology and Management, MS in Management and Administrative Science, and MS in Marketing. Students accepted to the MS in Information Technology and Management program have the option of concentrating in one of the following IT tracks: business intelligence and analytics, enterprise systems, cybersecurity management, IT consulting and services management, and healthcare systems. Students pursuing the MS in Management and Administrative Science degree are allowed to create and pursue an individual plan of study. The sheer number of online degrees and courses in Texas is enough to fill one’s head with questions. Where should I look first? How can I tell which universities are the best? What if I need to transfer? We’ve developed this guide to answer those questions (plus the ones you didn’t know you had). We’ll start by reviewing the distance learning landscape. Then we’ll profile affordable schools before warning you about schools to be wary of. Finally, we’ll provide links to websites you should bookmark. Ready to get started? The Lone Star State is stocked with high-quality online degree programs, and many of them are available through the Southern Regional Education Board (SREB) Electronic Campus. The Electronic Campus’s online program and course catalog extends well beyond Texas. You can actually search for any degree program or a specific course in 15 Southern states. If the program is marked “E,” you’ll be charged the Electronic Rate for tuition, which is the same for in-state and out-of-state enrollees. Several Texas colleges from our list of affordable online schools participate in this catalog: Lamar, Tarleton State, Texas A&M, Texas A&M-Commerce, Texas Tech, Texas Woman’s University, University of Houston, University of North Texas, University of Texas at Arlington, UT-Dallas, UTEP, UT-Permian Basin, and West Texas A&M. Can’t find your program in Texas? Although it doesn’t sound likely, it is possible. And the SREB’s Academic Common Market-Electronic Campus (ACM-EC) lets students who can’t find certain degrees in their home state pay in-state tuition at another SREB state’s schools. Texas only participates at the graduate level, and your desired program must be ACM-EC eligible. Apply through the institution running the program. By the way, the ACM-EC also works for grad students from a SREB state hoping to get a Texas credential. Let’s say you want to get an associate degree, but your nearest community college doesn’t have the program you’re interested in. Through VCT, you start by enrolling at your local community college, which can offer you the full range of support services. Then you take the courses you need from whomever is offering them. The Texas Common Course Numbering System (TCCNS) represents a statewide effort of 135 colleges and universities to make it easy for underclassmen to transfer their general education credits to another in-state institution. One way to use the website is to compare schools and see which courses will count toward your major at your destination school. Typically, community college courses adhere closely to TCCNS designations and naming conventions, whereas compatible university courses often have their own numbers and titles. Texas accommodates a whopping six different public university systems, not including the two-year colleges in the Texas Association of Community Colleges or Texas State Technical College (TSTC) system. Many of the state’s public higher education systems employ exchanges that allow students to take online courses from any other college within that system. Let’s start with two-year institutions. We’ve already seen that Texas public community colleges facilitate the VCT program to expand students’ options. The other two-year system, Texas State Technical Colleges, also makes it easy to take courses from other technical colleges. Enroll in one and then select online courses from its menu of choices. If you’re taking a fully online course, it doesn’t matter where your host campus is. The best part is that TSTC doesn’t add any fees for distance learning. The Course Exchange Program (CEP) covers the entire Texas A&M University System (essentially every school with Texas A&M in the name, plus Prairie View A&M University and Tarleton State University). The CEP lets students enrolled in any of the campuses take online courses at another campus within the system. You pay whatever the tuition and fees at your home campus are. The University of Texas Online Consortium includes seven universities (UT Tyler does not participate), all of which are easy to spot (their name starts with University of Texas or UT). It does two things differently than the A&M Course Exchange Program. First, it uses the rates not of the home institution but of the school you’re taking the course from, representing a potential cost savings. Second, in addition to a catalog of individual courses, it also offers several undergraduate and graduate programs, many of which combine the resources of several member institutions. The Texas Virtual School Network (TxVSN) makes sure all students from grades 3 to 12 can access free courses from five officially recognized online public schools serving the state: Comprehend Academy, iUniversity Prep, Texas Connections Academy at Houston, Texas Online Preparatory School and Texas Virtual Academy. While these schools target full-time students, other secondary schoolers can get a taste of online learning through the TxVSN’s course catalog. You’ll see price tags on each course, but these are owed by the school district, not the student, with some exceptions. For instance, the dual credit courses you see in the catalog may be paid for by the school district, school or students, according to the Texas Higher Education Coordinating Board’s (THECB) explainer on the subject. Even if your family must pay, these courses can represent a great savings, as upperclassmen can take up to eight courses — representing a year’s worth of college credit — for much less than they would as collegians. Arkansans, New Mexicans, Louisianans and Oklahomans qualify for a Bordering States Waiver at participating Texas public colleges and universities. Some colleges, such as Texas Tech, use a Border County Waiver for specific states instead. Such awards give qualified applicants a lower tuition than nonresidents. Texas doesn’t just have a lot of online higher education options. It has a lot of high-quality and affordable online options. This list represents the best in terms of the state’s nearly 150 higher education institutions (not counting the dozens of online career schools that fall under the Texas Workforce Commission’s jurisdiction). In creating our list, we considered multiple factors, including net price, credit availability and graduate success. We’ve winnowed it quite a bit, but if you need further help deciding where to go, compare your favorites on College Scorecard. The website analyzes similar criteria to ours and keeps information about each school’s most popular programs. MSU Distance Education is the hub for MSU’s online courses & programs. Further details are listed under each degree page. Current tuition rates are posted by the Business Office, but it’s the Office of Financial Aid that can help you apply for loans, scholarships & grants. Live out of state? Check the state authorization map to make sure you’re eligible to enroll in an online program—some degrees, like the BSRS, may not be available to you. Start with SFA Online. This has a comprehensive list of online degrees & certificates, as well as individual online & hybrid courses (an online course may have up to 3 campus visits per term). Are you still in high school? Some SFA courses that may be used for dual credit are offered online! Tuition rates are handled by the Business Office; you can use the Tuition & Fees Calculator to quickly determine your costs. Texas residents pay less, but out-of-state students taking an SFA ONLINE course may be eligible for a special Out-of-State Electronic Fee price. Search easily for online degrees at Tarleton State University’s Global Campus. Students who want to pair online courses with flexible evening and weekend (or day) courses, can do so at the Stephenville main campus or at the university’s Fort Worth, Midlothian or Waco locations. The school’s Tuition and Fee Estimator calculates your bill, and the Student Financial Aid Office can work with you to lower that price. The school website also keeps a list of scholarships for nontraditional students (though not necessarily online learners). Another plus: As a member of the Texas A&M University System, Tarleton takes part in the Course Exchange Program, which allows students to expand their online options to ten other campuses while continuing to pay their home campus rate. Texas A&M maintains a roster of online graduate degrees and certificates, and its admissions and financial aid procedures are the same for both traditional and online learners. A lot of variables go into the price tag, including residency, full-time status and distance education course load. See Student Business Services for a full explanation of tuition and fees. Not satisfied with the offerings? Texas A&M participates in the Course Exchange Program, which allows students at any A&M system campus to take online courses from other colleges in the system while continuing to pay their home campus rate. Engineering lovers, this one’s for you! Texas Tech is often in the Top 20 of U.S. News & World Report’s rankings of Best Online Graduate Engineering Programs. The gateway to the university’s degree and certification preparation programs is TTU Worldwide eLEarning. You can take courses online and/or via one of the school’s regional sites to maximize flexibility. Thinking about savings? Student Business Services’ Tuition Estimator goes in-depth on what tuition costs, juggling factors like residency, credit load and program. Another thing it will factor in: if you qualify for a bordering county/bordering state tuition waiver as a New Mexico or Oklahoma resident. Whether you do or don’t, explore the Financial Aid Office webpage for ways to lower your bill. Despite the name, men are also admitted to degree and certificate programs at Texas Woman’s University, a public school that is independent of the state’s six university systems. Nonresidents should be prepared to be charged a higher rate than Texans, but Oklahomans can get reduced tuition. Financial aid is the same for everyone. However, online students get a few perks, with TWU making two free tutoring resources available to distance education students: OWLive for writing assistance and Smarthinking for general coursework. UT Arlington Online maintains a distinct website separate from the one for on-campus students. From there, you’ll see that the prices are the same for residents and nonresidents alike, making the school a worthy destination for non-Texans. The financial aid webpage lays out ways for both types of students to lower their college costs. One potential strategy for lowering costs that doesn’t involve financial aid? Take a course via the UT Online Consortium. You’ll remain enrolled at UT Arlington but will be charged the administering school’s tuition rate. Business is booming at UT-Dallas! It often appears in U.S. News & World Report’s Top 10 rankings for both its Best Online MBA and its Best Online Graduate Business Programs (Excluding MBA). Visit its eLearning page to discover programs and courses and get connected to student resources. Financial aid is the same as for campus-based students. Keep in mind that the tuition and fees work on a sliding scale, meaning the per-credit rate for one class is high but the per-credit rate for a full load is significantly lower. As residents of a border state, Oklahomans pay less than other nonresidents. UT-Dallas also participates in the UT Online Consortium, which allows students to take online courses from another University of Texas campus while remaining enrolled at UT-Dallas. The University of Texas of the Permian Basis offers both full degrees and individual courses via distance education. Residents and nonresidents of Texas pay the same tuition for courses run by UTPB. The university operates some of its programs through the UT Online Consortium. These degrees are priced differently, though it’s worth noting that in many cases, nonresidents enrolled at UTPB who take an Online Consortium program pay less than Texas residents at other schools in the consortium. That’s partially because each school sets its own admission requirements and degree requirements, so the programs aren’t identical. Still, it’s a great way to save money on roughly equivalent programs. UH Online is well-known for its strength in teacher education—you’ll often find it in the Top 5 of U.S. News & World Report rankings for Best Online Graduate Education Programs. Read up on costs and financial aid before applying. Like some other public colleges in Texas, UH makes it easy for students to register for a semester to rack up transfer credits. Just apply as a Visiting Student, known at the state level as a transient student. Like the University of Houston, UNT frequently ranks in the Top 5 of U.S. News & World Report’s Best Online Graduate Education Programs. But it also appears in the Top 50 of online MBA, online criminal justice, and online bachelor’s programs rankings, which speaks well for the quality of its distance learning teaching. You can explore of all the graduate, undergraduate and certificate programs—and online courses—at UNT Online. The university assesses nonresidents a teaching fee instead of tuition for online courses, which usually results in cost savings compared to the on-campus rate. Oklahoma residents save even more, benefiting from low tuition thanks to a bordering states policy. Another highly regarded online player — especially for bachelor’s programs and graduate business degrees — West Texas A&M has a healthy catalog of hybrid and fully online degree programs and certificates to go with its web-based courses. One advantage of a WTAMU online education is the flexibility. Via its Education on Demand initiative, you can enroll immediately and begin taking self-paced courses without waiting for the semester to begin (although you can’t receive financial aid for such courses). Need to earn credits quickly to minimize time out of work? Register for six-week accelerated courses (which do qualify for aid). A second advantage of enrolling at West Texas A&m is its participation in the Course Exchange Program, which allows students at WTAMU to take online courses from other colleges in the A&M system while continuing to pay the West Texas A&M rate. Last, residents of Oklahoma and New Mexico counties that border Texas can take advantage of a lower Border County tuition rate. Southern Association of Colleges and Schools Commission on Colleges, also known as SACS, is the regional accrediting body for degree-granting higher education institutions in Texas. Check here first to make sure your school is legit. SACS provides a list of Texas schools it oversees. Scan it to see if your school has any public sanctions, such as a warning or probation. If it does, head to the Accreditation Actions & Disclosure Statements section for details on why. If your college isn’t there, don’t panic. It might be nationally accredited instead of regionally accredited. Move to the Council for Higher Education Accreditation (CHEA) Database to find all schools with government-recognized regional or national accreditation. In 2016 SACS placed Angelina College on probation because the institution neither demonstrated that it was governed with integrity nor showed evidence of positive student learning outcomes. Probation is the last step before losing accreditation altogether, and the SACS board of trustees will decide Angelina College’s fate in 2017. In 2016 SACS placed the Art Institute of Houston on warning for failing “to provide evidence that it (1) has a sound financial base and resources demonstrating financial stability; (2) exercises appropriate control over all its financial resources; and (3) has appropriate support for the implementation of its Quality Enhancement Plan.” The Art Institute has campuses across North America and its online division is run out of its Pittsburgh campus, so Houston students shouldn’t be affected. Austin Bible Institute, which places all its courses online, is not accredited. You won’t find it in the CHEA database or on College Scorecard. In 2016 the College of Health Care Professions’ accreditor, the Accrediting Bureau of Health Education Schools (ABHES), placed the school chain on show-cause, the final step before pulling its accreditation. ABHES did not publicly disclose the reason for this action. In 2017 school administrators will meet with ABHES board members to provide evidence for why the schools should remain accredited. Cranmer Theological House, which allows some courses to be taken via CD or DVD, is unaccredited and unrepentent. You won’t find it in the CHEA database or on College Scorecard. As the school falls under the auspices of the Reformed Episcopal Church, graduates of its master’s programs are likely aware of the narrow purposes for which their degrees are intended. The DeVry for-profit chain is accredited, but its schools are under fire from the Federal Trade Commissions (FTC). In 2016 the FTC sued DeVry for deceptive advertising practices that inflated graduation rates and graduate income levels. In 2016 SACS placed Navarro College on warning for making substantive changes to a program without notifying SACS and getting the go-ahead. The accreditor also could not find evidence that Navarro “provides appropriate academic support services.” Navarro College was removed from warning on June 15, 2017. Remington College, which has four locations in Texas as well as an online campus, is accredited by the Accrediting Commission of Career Schools and Colleges (ACCSC), a national agency. The Century Foundation criticized the school chain in its 2015 report, The Covert For-Profit, implying that its seemingly nonprofit structure is actually designed to benefit a small group of administrators while dodging regulations specific to proprietary schools. Texas Bible College, which hosts a distance education platform called TBC Online, is not accredited. You won’t find it in the CHEA database or on College Scorecard. Tyndale, which promotes its Cloud Campus offerings as materially equivalent to the ones at its Dallas-Fort Worth location, was at the heart of a 2007 decision to allow bible colleges to position themselves as academic institutions without state oversight. Whereas many bible colleges still seek accreditation from the Association for Biblical Higher Education (ABHE), a government-recognized agency, Tyndale plans to remain unaccredited. Therefore, you won’t find it in the CHEA database or on College Scorecard. UNT-Dallas College of Law, which opened in 2014, isn’t much of an online player, but its website does note that students can take (or transfer in) up to 15 credits via distance education. Those students will want to keep track of its accreditation status, because as of November 2016 it had yet to gain approval from the American Bar Association. Without it, graduates can’t sit for the state bar exam or practice law in Texas. University of Phoenix is an Arizona-based for-profit college with campuses in Texas. According to the CHEA Database, the University of Phoenix is regionally accredited. However, according to College Scorecard, graduation rates at its Texas school are very low even though its net cost is above the national average. Southern Association of Colleges and Schools Commission on Colleges (SACSCOC): SACS is the regional accreditor for Texas colleges and universities. Students at SACS-accredited schools are not only eligible for financial aid but also have an easier time transferring credits than students from nationally accredited institutions. Apply Texas: As the name hints at, ApplyTexas is the portal through which most Texans apply for entrance into a public university. Although ApplyTexas is not specific to distance education students, it’s a valuable resource nonetheless. That’s because it lists consolidated entrance requirements and details application instructions while also explaining the state’s various application types (e.g., freshman, transient and transfer). College for All Texans: Another web resource equally relevant to on-campus and online students, College for All Texans features a section specifically for adult learners that covers basics of financial aid, prior learning assessments and transfer credits. Grad TX: Grad TX is a THECB initiative aimed at returning college students. It partners with a dozen universities in the state to offer adult learners credit for the courses they’ve already taken, then works with them to create a flexible schedule filled with online classes and accelerated courses so they can complete their bachelor’s degree. Texas Common Course Numbering System (TCCNS): Go to TCCNS if you’re planning on enrolling in a Texas community college then transferring to a state university, as the website provides details on transfer credits. You’ll also want to check it out if you’re considering registering for a semester online as a transient student. Texas Higher Education Coordinating Board (THECB): The regulatory body for all academic higher education institutions in Texas, THECB features both valuable tools for all types of students (such as a degree program search) and resources for prospective online learners, including an extensive FAQ on distance education in the state. Texas Higher Education Data: Data junkies, rejoice! If you want to see the year-by-year performance figures for each college in the state, including enrollment stats across distance learning programs, you’ll have access to all the Excel spreadsheets you could wish for. Southern Regional Education Board (SREB) Electronic Campus: SREB allows you to search for online degree programs or courses being offered by participating institutions throughout the South. The SREB website also discusses credit transfers and financial aid. Texas A&M University System (TAMUS) Course Exchange Program (CEP): Once you’ve enrolled in a TAMUS school, you’ve got access to more than just your home institution’s online classes. You can attend an online class from any school in the system. Search its catalog to see what’s available in the upcoming semester. Texas State Technical College (TSTC): The 10 campuses in the TSTC system pool resources when it comes to distance education so that a student at one campus can take online courses from any other campus. Use the arrow on the lefthand side of the course catalog webpage to modify your search options by semester and program. The course type is up to you. Fully online, partially online and night/weekend courses are all options. Texas Virtual School Network (TxVSN): Not happy with the courses your local high school offers? Use TxVSN’s catalog to find Advanced Placement, dual enrollment and run-of-the-mill courses that supplement your course load. In most cases, they’re free. Texas Workforce Commission (TWC): TWC regulates the state’s vocational institutions. Use its career school search tool and filter for distance education. Click on the school to get details about course delivery, cost, credit hours and historical completion rates. University of Houston System: Search online programs from any of the four institutions in the University of Houston System. UT Online Consortium: As a student at any University of Texas system school, you can enroll in classes from the consortium’s course inventory of web-based classes. If you’re not yet enrolled, scan the consortium’s list of fully online programs to see if any pique your interest. Virtual College of Texas (VCT): The VCT serves all Texas community college attendees. Run a search to see start and end dates for upcoming online courses across all the state’s two-year colleges. If there’s space, talk to your local campus VCT coordinator to enroll.